A Mad Men type silhouette balances on a tightrope, while a dizzying vortex swirls below his feet. 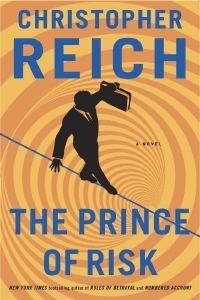 The cover image of The Prince of Risk offers a powerful visual representation of Reich’s latest, unsettling tale set in the fast-paced world of Wall Street. Published in December 2013, the novel tells the story of Bobby Astor, a hugely successful hedge fund manager on the verge of making yet another killing. Then his father, CEO of the New York Stock Exchange, is murdered and his world is shattered. The murder is a breathtakingly audacious: it takes place on the White House lawn and the head of the Federal Reserve is also killed. In the moments before his death however, Bobby’s father sends him a mystifying text message: one single word that offers the only clue to the identity of the killer and the motivation behind the attack. In searching for the truth, Astor is plunged into a world of billionaires, mercenaries and international conspiracy. This isn’t just about saving his company and bringing his father’s killer to justice – it’s about uncovering a plot that threatens the entire US financial system. A former stockbroker and Swiss banker, Christopher Reich is now a New York Times best-selling novelist whose books have appeared in more than 23 languages. The Prince of Risk is his ninth novel and may be his best yet. Its murky and sinister world, where high finance, terrorism and international conspiracy collide, makes for a thrilling and compelling page turner. Could something like this really happen in the future? We put so much trust in technology which we believe will keep us safe – but it may be that it exposes us to more danger than ever. For me, the novel’s prescience is perhaps the most unsettling aspect of all.